Many escalators used in the metro station: passengers can take the escalator to the platform to wait for the train when they get their tickets. Before the subway escalator operation, it was inspected by the security department. After operation, there are professional departments to carry out maintenance and repair. To ensure safety, in cities as Nanjing in China, subway escalators speed from the original zero. 65 meters per second minus 0. 5 meters per second. The starting point is to reduce the discomfort of a few passengers and avoid the occurrence of falls. 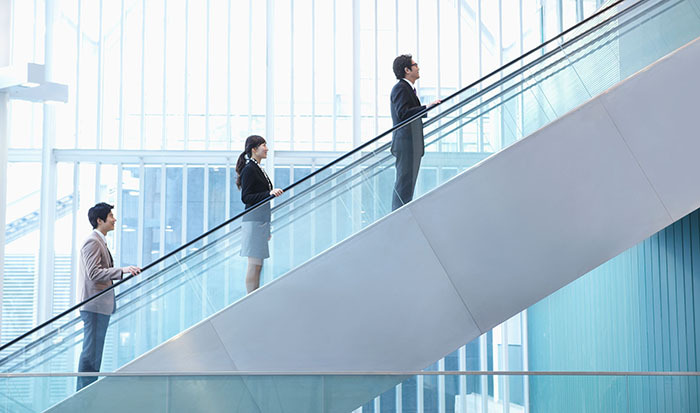 When take the escalator, passengers should first see the direction of operation, and stand firmly in the yellow safety line on the same stair. Stand on the right side of the escalator and take care of the children and the elderly. Watch your luggage carefully. Avoid getting close to the edge of the stairs so that your feet and clothes are stuck in the cracks, especially if you wear a long skirt. Do not play or run on the escalator at the same level or on the escalator. Do not push strollers or trolleys on escalators. Do not use escalators when carrying large luggage. In case of accident, press the emergency stop button of the escalator. If necessary, do not abuse the emergency stop button so that other passengers may fall and hurt. Do not use the escalator when the escalator fails or is being repaired. Posted in Company News, Unkategorisiert and tagged escalator emergency button, escalator used at metro station, heavy luggage with escalator, how to safety take escalator, how to use emergency button of escalator, where is the emergency button of escalator.